I've been wanting to make this cake for quite awhile. Today was the day. The cake was delicious but it didn't wow me like I thought it would. I liked it enough that I would make it again. It's REALLY easy to throw together. Whenever a cake involves oil instead of butter, it's so simple. This one uses no butter in the cake - all oil. This cake is ULTRA moist. It was moist even before you pour a mixture of lime juice & powdered sugar over the hot cake. One thing I was surprised about is the subtle lime flavor. I thought it would be "in your face" lime! Like POW! No, it's a lot more subtle. Definitely lime but not strong. I made a double recipe and it made 3 nice size layers of the cake. I don't see how a single recipe can result in layers that are thick enough. Maybe a double layer cake with a single recipe. I made the cream cheese icing but added lime zest to it and some big squeezes of lime juice. This would be a wonderful cake for a summer barbeque. I can just imagine the nice light crisp lime flavor in the heat of summer. If you do not bake often or don't consider yourself a very talented baker, this might be a good cake for you to make. Seriously, this is about as easy as a cake mix. It's such a moist cake that it was difficult to get a really clean slice. 1. Preheat the oven to 350°F. Grease and flour three 9-inch-round cake pans. 2. In a large mixing bowl, mix the gelatin, sugar, flour, salt, baking powder, and baking soda. Stir to mix well. Add the eggs, oil, orange juice, lemon juice, and vanilla. Divide the batter evenly among the 3 pans and bake for 35 to 40 minutes. Test for doneness by lightly touching the tops of the layers or inserting a toothpick. Cool the layers in the pans for 5 minutes, then turn them out onto racks. 3. While the layers are still hot, mix the lime juice and confectioners’ sugar and pour it over the layers on the racks. You can pierce the layers with a fork to allow the glaze to soak in better. Allow the layers to cool completely as you prepare the icing. 1. Cream the butter and cream cheese. Beat in the confectioners’ sugar until the mixture is smooth and easy to spread. Spread the icing between the layers and on the top and sides of the cake. Note: The cream cheese icing is optional. This cake is beautiful and tastes great with just the glaze poured over it. Serves 12. I found this posted on Pinterest. This cake looks delish! I can't wait to try it sometime soon. Thanks for posting it, this is the first time I have been to your blog and it won't be the last. Thanks for your "warning" about the subtle taste. I was also picturing (tasting?) full-on lime flavor. I think I'll "up" the lime juice and "down" the orange juice. Thanks for posting this!! Can't wait! key lime juice doesn't seem to have quite the POW that regular lime does. It is a more subtle flavor. I agree, I haven't made it yet, but I'm going to use key lime juice instead of the orange juice. 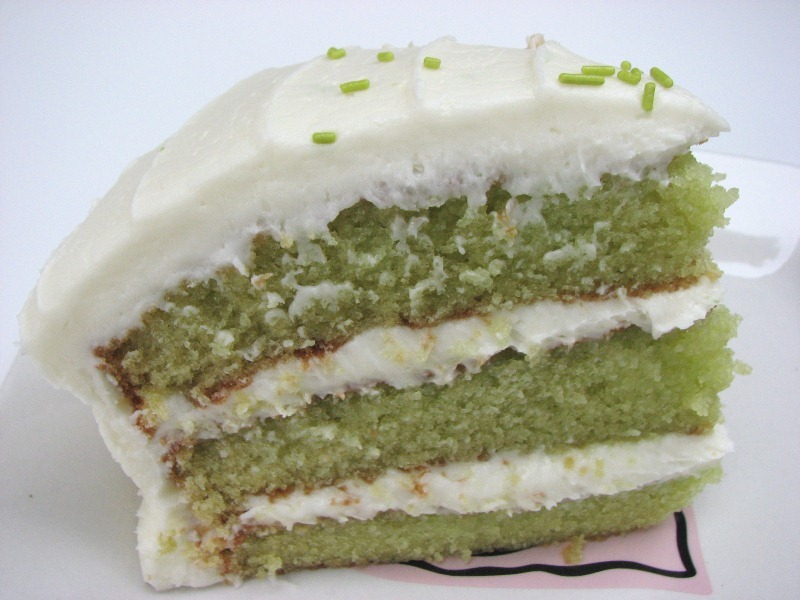 If you bake this key lime cake, my sailor stationed in Navy at Bremerton would love it. This is one of only a few cakes he loves. Ahhh.....Naval Base Kitsap. That is about 45 minutes away. Honestly, if it were closer, I would make the cake for you & deliver it for ya! You should definitely try this recipe though. It's such a wonderful flavor for warm weather. I tried this yesterday for Mother's Day and I'm gonna have to say I was not impressed. Sorry. I ended up throwing it all out. I made it for Mother's Day as well and it came out really great. It's moist and light at the same time which is a win in my book. I switched out the orange juice and used limeade instead. Also, added lime zest to the cake batter. Didn't make the icing, just made a thicker version of the tangy lime glaze over top of the cake. Would love to figure out how to replace the Jello, tho. Not my favorite ingredient. Please...Do not make this cake if you haven't. It taste like pure ----! 1 1/2 cups of oil...seriouly? Sorry you didn't like the cake. A lot of folks prefer butter. 1.5 cups of oil is alot. I actually think the recipe could benefit from a little less oil but I was just following the recipe. If you're looking for stronger flavor, I always use the recipe on www.bettycrocker.com for "key lime cupcakes", using vanilla or white mix instead of (and omit the glaze on top). It's always a hit! Great lime flavor! Here was my substitutions: 1. I used equal amount of plain applesauce instead of oil. 2. To hide the apple flavor (? Wasn't sure it would surface) I added 1/2 box (sm) key lime or lime jello to applesauce (used sugarfree jello). **Note: Applesauce is friendlier than butter or oil and has a natural pectin that makes your cake delicate fluffy and more firm to stand well better in layers! Used this for years <3! *** 3. DO NOT USE OIL JUST PLAIN APPLESAUCE Measured like liquids! 4. Just a note about glazing Southern Style: they usually let the cake stand (frosting only between layers to hold together. Poke holes through cake layers after cooled and drizzle glaze to soak in. Make sure you poke holes thru all layers (skewers! )...hopefully you have a cake stand handy with a cover....as you will repeat this process for a couple days. Glaze keeps cake moist. After you've finished glazing over 3 days usually ....you would finalize frosting the cake then. Your cake won't slip and usually the make the cakes on Wed. For Sunday Desert. My Rum cake you glaze pickle from Thanksgiving until night before Christmas....Frosting Christmas morning ((((HUGS)))). I also thought this would make a great idea using Angel Food Cake, Glazing for few days, and frosting with Whipcream like a pie! One and a half cups of oil just sounds revolting. No wonder you can't get a good "clean" slice. And it doesn't surprise me that the flavour is subtle. Of course-it has way too much oil for the flour ratio. Definitely needs to be modified. I changed this recipe eliminated the oj.And used limeaide.I loved it. Wow! I think this cake is awesome! I love the color and the moistness of the crumbs! Yum! I must say, I'm surprised at all of the comments made about this cake and it seems like it's all within the past month. People seem to either hate it or love it. The amount of oil called for in the recipe seems to really be the thing that they cannot get over. I think it's a lot also but hey, it's what the recipe called for so I followed it. I don't bake like that every day so it's doesn't bother me too much. Overall, the cake is lovely, moist and great for warm weather. My big change would be to add more lime flavor. Dont let all these bad reviews scare you away from making this cake! It was a wonderful hot afternoon cake and a hit with the family! Plus it is so beautiful! The only change i made was NO OJ and instead used the 100% lime juice in the bottle! Also only 1c of oil and yes it is still very MOIST! and added just a tad of lemon juice to the icing! This was so good and Im so glad i tried it for myself! My kids arent even real lime fans and they gobbled it up lol!! The oil was never even tasted and the texture was perfect! Another comment above suggested using limeaid. I think that sounds like a great idea. Next time I make this cake, I will definitely use limeaid. I kind of don't like the idea of using the soaking glaze before icing the cake. The cake is plenty moist as it is although I do realize the glaze probably does contribute a lot of the lime flavor. I'm surprised that one of the liquids that is called for is orange juice, It definitely should be lime flavored. I altered this just a bit. Only used 3/4 cup oil and 1/2 cup oJ. Added juice of one medium size lime and lemon, plus zest. I also put a splash of Keylime juice in the batter. I also added lime and lemon zest to the glaze. This made my cake have " in your face" lime taste. My family loved it! I'm not a fan of making round cakes due to storage reasons (I have glass Pyrex with lids that I love for that reason...). How would I be able to modify this for a 9x13 glass dish? Would I simply follow the recipe above and then alter the baking time? Any insight would be appreciated! Thanks! As I mentioned above, I made a double recipe of this key lime cake and it made a perfect 3 layers. I would think that a single recipe would nicely fill a 13x9 inch pan.....maybe have a little extra. The recipe states that a single batch would result in three 9 inch layers. I just don't see how that can be unless the layers were ultra thin - there really is not that much cake batter. That's why I'm guessing a single recipe would fit nicely into a 13 x 9 inch pan. I also like making cakes in sheet pans or the rectangle pans. I do love the look of a towering round 3 layer cake but I love the ease of a snack cake. I made this cake once and thought it was awful, too. Way too oily, and I had a hard time getting the layers out of the pans which is strange considering all the oil. I am a very experienced baker with a home cake business. This cake was not good! I'm curious if you could make a serious short-cut... Use a vanilla or white box mix and replace the water with lime juice. I'm wanting to make a key line cake for my grandmothers 80th birthday. I will be traveling 500 miles to see her and will have to make it there. Any thoughts? Well that sounds like a possible shortcut. Maybe limeaide would work just as well. Limeaide concentrate is so potent that u can just mix it with a very small amount of water before using. I think many cakes mixes need a cup or more of water & that would be a lot of lime squeezing. I personally would try limeaide. Save your fresh lime zest & juice for the icing. But driving the cake 500 miles?? Yikes...that's a long ways. I don't know how well any cake would hold up for that many miles especially if the weather is hot. Please let me know your results if you try it. I love lime & a shortcut for an awesome lime cake would be great but remember, this recipe as written is honestly almost as easy as a cake mix. Good luck. I made this cake for my hubby today because he loves Key Lime Pie...well, now he loves Key Lime Cake! This was perfectly delicious and I thought had the right amount of lime flavoring. I do think next time I will cut back on the oil some, but overall this was a fresh, citrusy cake that I will absolutely make again! Has anyone altered this for a pound cake? Oooo....key lime poundcake would be delicious! I think somewhere on my blog I have a lime poundcake and it's one of my favorite cakes. I actually prefer the texture of poundcake to regular layer cake types as long as it's a very fine moist crumb. If you make this into a poundcake please let me know the results! So is the recipe above the original version or the doubled version? The recipe above is the original single version. It doesn't make a lot of batter. You might also try using some of the lime zest. It has a very potent flavor and aroma. Hmmmm...I find just the opposite to be true. For me, key limes have a much more distinctive, "limey" flavor and aroma than regular limes. Funny how different people taste things differently. I love this cake. We first had it in Thomasville, GA at a lovely little spot called Savannah Moon. Loved it so much that we had it served out a rehearsal dinner in spring time. I have since learned how to make it pretty spot on. I do prick the cake with a toothpick and then carefully spoon the lime/confectioner sugar over the cake. I will then allow it to soak this up. I have found that in order to give it more of the lime flavor I will put the sides with the lime/confectioner sugar back to back (with a layer of frosting in between) We will keep it in the refrigerator. It is cook and refreshing. My husband loves key lime pie and so I decided to bake this for his birthday. After reading all these posts I was really nervous. It was DELICIOUS and my entire family LOVED it!! I did make a couple of small changes. Instead of just orange juice, I used the juice from 2 regular limes + enough OJ to make the 3/4 cup as called for. I also used a 1/4 cup LESS oil than the recipe. However, my best adjustment was probably adding a Tablespoon of my fresh squeezed key lime juice to the cream cheese frosting. The cake does NOT have a subtle lime flavor. As long as you poke holes throughout the cake before covering it in the glaze, it soaks up all that tart key lime juice and is awesome! I'll be making this year after year to celebrate his birhtday! I have made this cake before... Trisha Yearwood has many recipes in her cookbook that are right on the webb. I can't believe they let her put all of these recipes that are not even original in her book. I got the recipe off of cake central.com YEARS ago. Her pound cake recipe was on all recipes.com more than 10 years ago. I made this cake for work the other day and was not impressed at all. I didn't have 3 rounds so I used a 9x13 pan. I should have used a 11x15 pan instead. The cake middle took a while to bake and so the rest of the cake got over done. The cake batter (raw) didn't really impress me so i added extra lime juice to it. I even made a double batch of the glaze to put on it and extra icing. All together it was so so, but i won't be making this again. I know this is a late reply....sorry. I often make a cake using a yellow cake mix and replace the water with Margarita Mix from Williams-Sonoma. I bake it in a bundt pan according to the directions on the box. For the top, I mix up some powdered sugar with either lime juice or more margarita mix and lime zest. Looks pretty and tastes great! I made this cake and it was soooooo goood! I just added less orange juice and a little more orange juice and it was delish! My pregnant sissy ate three slices in one night..it was that good. What a huge disappointment! Maybe Trisha yearwood should stick to singing!! I followed directions EXACTLY. All burned after 15 minutes and the cake was very bland. A waste of time and money. I don't know how yours looked this pretty. The only ok part was the icing, but I had nothing to put it on. Very glad I was just experimenting and didn't make this for a dinner party. Complete disaster. If I could give it negative star review I would. i too made this the other night and it was not good. I bake quite a bit and was really excited to try a different cake recipe. This was not impressive at all and I followed the directions exactly. To start off I used three 9" inch pans. I greased them well and divided batter "evenly". What's strange is that there was not that much batter. I figured it would rise. I checked it after about 20 minutes and the tops were already burning. The recipe stated bake 35-40 minutes. That's just insane because it would have been burned to a crisp. The icing was good. But I threw the cake out. The batter I tasted was very bland Will not be making this again. I agree, there is not enough batter to divide between 3 pans. Well, you CAN divide it but the layers end up being so thin! That's why I made a double recipe and used 3 pans. It was just the right amount. I wonder if she made an error in her cookbook when she wrote 3 pans..hmmm? As for the other citrus juices being added, that's what Trisha called for so I was just following directions but I did add a lot more lime zest than what the recipe called for. It still was not a strong lime flavor. this sounds great, with cream cheese frosting, yum! This comment gave me an idea-- how would it be to bake on a large cookie sheet, and turn it into a cake roll?? Now, I haven't made this cake yet, so I don't know if it's said "moistness" would become a problem in my scenario. What do you think? This cake is awesome! I was kinda reluctant after reading some of the complaints on here, especially of those that call themselves professional bakers that even own bakeries. Thakfully I'm hardheaded and make my own decisions and this was an excellent one! I did make a couple of changes, I only used one cup of oil and I added lemon and lime zest to the batter. I added lime zest to the glaze and frosting as well. As for layers, I only madetwo 9" pans, perfect size! It is a little more difficullt than your average cake to get out of the pan, I assume the jello has something to do with this, I just ran a butter knife along the edge of the pans pushing gently towards the center and it came right out with no issues. Thank you for sharing this recipe, its a keeper for sure! Great summery taste! You can always replace oil in a recipe with apple sauce! Much better! Hi, the first time I made this cake, it came out just like your photo and tasted heavenly! The next time I tried it, I switched to nonstick pans and the cake was burned to a crisp. I threw it out and tried again, and the cake came out with indentations in the top and tasted terrible. I didn't alter anything in the recipe other than the pan I cooked it in! I'm so disappointed. After two fails, I will not be making this cake again. I am so sad I could not recreate my initial success. I watched Trisha make this cake on her show the other day. Her recipe was 1cup of oil, 1/2 teaspoon baking soda,1Tablespoon vanilla (not what this recipe is saying). She then poured it into 9x13 cake pan and baked it for 30 minutes at 350 degrees. Your comment about the ingredient amounts made me curious so I went and grabbed my Trisha Yearwood cookbook. The amounts that I included in my recipe are the EXACT amounts that my book calls for (I'm looking at it right now!). I bet ya anything that she changed the ingredient amounts because of the comments on this cake from various bakers. Just fine tuning it I guess. But I think 1 cup of oil sounds much more reasonable than 1.5. I wish I would have seen the episode where she made it. I really like her. I also agree with her change of more vanilla. I'm always in favor of more vanilla. Very rarely do I put the called for amount of it. As for her change in the baking soda from 1 tsp to 1/2....I'm not sure about that. Baking is scientific and 1/2 tsp less of soda obviously has some effect on the rise of the cake. It didn't rise a lot before the change so I'm not sure. Just made this cake it was delicious! I made a few changes which I think made a huge difference. I only used TWO round pans and it was a perfect amount of batter, there is no way there would have been enough for 3. I also followed the last comment and made the changes Trisha did on her show. I also did not use OJ but upped the lime... It really has a great lime taste!! Hi! I am very intrigued by this cake, after seeing the beautiful pictures and reading all the contradicting reviews... :) I would like to make it, but was wondering if anyone has tried the recipe with cupcakes instead? Do you think it would be a good idea? Thanks in advance! I made it and it rocks, I also put lime juice in the icing ! I used lemon pudding, instead of jello, limeade instead of orange juice, and used half the oil. Then I put whipped cream over cake! Yum! I've had a very similar recipe for years from my sis in Georgia. It is my favorite. Hello folks..... please listen to everyone here informing you about replacing the OIL with APPLESAUCE. What could be easier? Just keep the small cups of applesauce on hand. One of those little cups usually works out for the amount I need for a cake. If you need more than that, just use two of the little cups. You can buy a large jar of applesauce and refrigerate it after opening it. This ALWAYS works great. There is no problem with the flavor of the cake, and you have reduced the fat and calories. I first heard of this on the Oprah Winfrey Show many years ago when her personal chef was on the show and demonstrated many cooking secrets she used to cut calories from Oprah's diet. I definitely agree with the person who said that baking 35-40 minutes would burn the cake. I did bake mine for 35 minutes, and it was too dark. It wasn't burned, but definitely on the verge of burning. I would say bake 25-30 minutes (maybe even less). I was going to bring it to work, but decided not to because it was almost burned. That was the only disappointment, however. Otherwise, it's a lovely cake. I made it--awesome!!! I made it as cupcakes with only 1 c butter and fresh key lime juice instead of orange, topped with whipped cream and chopped strawberries. I can't figure out what the complaints are about. I made this in a bundt cake pan and it turned out well. The baking time was between 35 and 40 minutes. You will have to monitor that closely as it will burn on the top. I kept layering the lime glaze on it and it gave it a wonderful "lime punch zing". The cake was extremely "wet" so I do think I will lessen the amount of oil the next time I make it. WHY????????? ?is the cake green? Real key limes are yellow and have yellow juice. People who make key lime pies, cakes and cookies green don't really know what key limes are, Just a little information about fruit! I agree AS WRITTEN this cake should not be in the oven for 40 min. That's much too long (even though this is the time my cookbook actually calls for). I made a DOUBLE recipe when I made it and divided it between 3 pans so my layers were much thicker. I personally think a single recipe should not be dived into three 9 inch pans....maybe three 6 inch pans but even that would be pretty thin. And the oil amount calls for 1 1/2 cups which is ONE cup PLUS 1/2 cup. That is what my book calls for but I believe Trisha has since changed that because supposedly she went on TV to make this cake & used only 1 cup oil. I've made this cake only once but I think 1 1/2 cups was too much. I think 1 cup would be adequate. As for the color, I guess its personal preference. I kind of like a slight green color even if its caused by a few drops of green food coloring. I think the green reminds people more of lime. The green cake right next to the white icing looks really nice. Its a presentation thing but you certainly don't have to add food coloring. I DO think the icing needs much more lime flavor & that is remedied by adding some straight lime juice & lots of lime zest. I think I will try making this again soon. I will make a few changes then will report back! I made this cake for a baby shower. I baked it in a mini cup cake tin lined with foil paper. I made 24 mini cup cakes plus 12 regular cup cakes and still had batter left over for an 8 inch round layer. It came out perfect! So delicious! I also made the cream cheese frosting with lime juice and piped in on the cup cakes. Then sprinkled a little lime zest on top. Everyone raved about them! Thanks for the recipe! Seriously? You obviously do not bake often (ever). I'm not sure who you are referring to Anonymous when you mention someone who obviously never bakes but it sounds like a snide & rude comment. Maybe you should just agree to disagree. Why would it bother you so much that someone else has a comment that you do not agree with? I don't care how often someone bakes - once a day or once a year - we are all still learning and we all have different tastes. Bake on!! Wish it wasnt so long since you posted. I'd lover your Rum cake recipe! My dad is a huge key lime pie fan, so I figured this would be a fun twist on the desert and a nice Father's Day treat. The cake turned out perfectly and my dad returned for a second piece! I generally read blog comments before executing the recipe, but jumped straight to the baking this time around... once the cake was in the oven, I started reading what everyone had to say and got a bit nervous thinking that the lime flavor wasn't going to be there and that the oil would be overpowering. Not the case at all. Though the cake left a small grease spot on our paper plates, it was incredibly light and limey. I did add 1/4c key lime juice to the frosting just to make sure the flavor wouldn't be missed, but that was completely not necessary! Also, I didn't have 3 cake rounds, so I cooked it up in a 9 X 13 pan, which worked perfectly. Overall, a great summertime cake! This is one of my families favorite cakes. Have made it for years. Always use the same recipe. When I turn mine out of the pan, I put my wire rack over the top of the pan and flip. I've never had a problem with the cake sticking. I also make sure I trim the edges with a pair of kitchen scissors to remove any "hard" crust before I frost.. I don't think I would personally substitue regular gelatin in place of jello. I mean, it MIGHT work but a box of jello also includes the flavoring and sugar. I guess you can add a separate lime flavoring and additional sugar. I never even considered that some folks might not have access to classic jello brand gelatin! I'm not sure what your outcome will be with the regular gelatin but now I'm curious so please respond with the results if you decide to make it. I agree, it's an awesome summertime cake. I also include the lime juice in the icing. 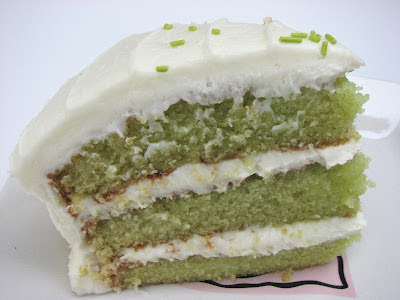 I wanted to UP the lime flavor when I made it and having a tart lime icing really brought the cake over the top delish. Lime zest really adds to the icing also plus it has pretty little green flecks. I think I would make this cake more often but nobody in my family likes lime so who do you think would end up eating much of the cake? ME! And that's not such a good idea. I'm struggling with my weight lately as it is so I don't need a delicious cake sitting on my counter waiting to be eaten. How can you know how much applesauce to use? If a recipe calls for x amount of oil or butter...is it equal or what?? I've tried this once before...in a Hummingbird Cake...turned out nasty! * Never add more than 1/2 cup apple sauce. If the recipe calls for more than 1/2 cup oil, substitute apple sauce for half of the oil. * To cut and serve reduced fat baked goods and prevent crumbling, allow to cool 10-15 minutes and cut using a plastic knife. So, for the Trisha Yearwood's Key Lime Cake, since it calls for 1½ cups vegetable oil, you should only substitute in 1/2 cup applesauce and the remaining 1 cup should be the vegetable oil. This will help reduce the fat & calories, and you shouldn't have the issues you encountered with the "Hummingbird cake". Hope this helps clarify things for you. Good Luck! I've been really excited about making this lime sponge, well today I finally found time, I've made a few modifications though so hopefully it'll be fine!! No lime gelatin (don't think we have it here in the UK) no orange juice, but added the zest and juice of 5 limes, I used 3 x 8" cake tins, plenty of mixture in all of them......so fingers X, watch this space!!! Is the gelatin used here powdered or is it like jelly cubes? NOT already made gelatin. You use the powder that comes in the box. Anonymous, you are absolutely wrong. 1 c means one cup. 1/2 c means half of a cup. 1 1/2 c means one AND one half cups. I'm also about 45 minutes from the base and, since I was also a Navy wife (many years ago) I would be happy to make and deliver the cake to Gina Marie's sailor husband. Gina, my name is Peg and my email address is: pbarker4149@embarqmail.com - if you want to email me and let me know how to find your husband, I'd truly be happy to deliver the cake from his loving wife. Also, just so you don't have to "worry" about another woman baking for your husband, I'm 64 years young with my own veteran husband and my children are all in their 40's! So no worries. :-) P.S. I was reading down the reviews and one really hit me. If I use a white cake mix and limeade or Margarita mix instead of water, it should have great lime flavor and bake it in a bundt pan. Then for the topping, mix powdered sugar with either lime juice or more margarita mix and some lime zest. Yummy and easy too. Do you think your husband would enjoy a cake like that? I think a bundt cake would be easier for him to handle. Gina, I'm serious about doing this for you if you want me to. When my husband was overseas, I had an "older" lady who lived next to the apartment I was in and she was so kind to this young Navy wife. I remember she once said to me, "Someday you'll have the chance to be kind to another military wife and I expect you to do what you can for her." This is my chance. Take it if you want to. Very touching. I hope she took you up on your offer. I made this cake the other day for a coworker who helped me move my furniture. It was amazing! I used lime juice instead of orange juice, and I put 1 cup of canola oil instead of 1 1/2 cup vegetable oil. I also put zest of 1 lime and 1 tsp. Of lime juice in the icing. I added a bit of green dye to make my cake a little darker as well. Next time I think I will try 3/4 cups of canola oil as mentioned in some of the other comments, the cake was very moist (not complaining by the way) but I don't think it will matter if I use less oil because of the amount of eggs called for in the recipe. It's the egg yolks that make a cake moist (whenever in doubt of how moist your cake will be add an egg yolk). It was a very moist, and delicious cake! Overall the rcipe was great, I had a beautiful blue and green cake! I made this cake for Thanksgiving dinner. After reading all the reviews I substituted the orange juice for fresh lime juice. It was too limey/citrusy. It was still good, but too much lime. Plus I juiced my limes in my juicer, so I got the ultimate lime juice! Brought the cake to work because my hubby didn't like the sweet tart cake lol! Everyone at work loved it, but some feedback was that it was too limey but still good. Next time I'm going to keep the orange juice, but substitute the lemons for limes. And maybe I will just aqueeze the limes instead of juicing them. This is very easy cake to make! One of the easiest cakes made from scratch that I ever made. No reason to be mean! Constructive criticism is one thing, nastiness doesn't help anyone. As such, they must exercise a high degree of caution at all times, as well as monitor local media and follow the instructions of local authorities. Distinct kinds of holidays in Burgundy can be planned beforehand, which might involve a specific activity, such as mountain biking or hiking in the lovely countryside. For more information on village bakery check here.